Felipe Lopez was being pummeled by Our Washington Nationals. Virtually all his teammates were rushing on to the field in great joy. Our Manager Manny Acta was clapping his hands in rhythmic applause with the gathered crowd. Just 30 minutes beforehand--FLop was destined to be one of the goats in this afternoon's affair with The Atlanta Braves. But New Nationals Park was now jumping, celebrating, because Baseball, That Great Equalizer Of Sport--had given Our Number Two a second chance. That same opportunity handed Shawn Hill this afternoon. And a resurgence from that awful start--now directly feeding Our Washington Nationals on to victory. Baseball is skill. Sometimes luck. And Many Times--OPPORTUNITY. 29,473 witnessed this afternoon on South Capitol Street some of the very best that Major League Baseball has to offer--including some inopportune errors, and one thrilling finish. One enjoyable game that went down to the final At-Bat. A situation that not many still remaining at New Nationals Park thought possible--heading to the bottom of the 12th. The Atlanta Braves and Our Washington Nationals had battled to a standstill all this late afternoon--into the early evening. The 4:36PM start a blessing for two sinker ball pitchers throwing in the late afternoon sun. Both Our Shawn Hill and Atlanta's Jair Jurrjens were on top of their games. Both going deep into the affair. Eight strong innings for Our Number 41 and Seven well pitched frames from Jurrjens. A pitchers duel had broken out. Sure, there was a double here, a blooper there and an RBI Groundout--but everyone watching knew who was in charge. Hill & Jurrjens were setting the pace--despite each giving up just one run apiece. A tempo that continued well after both had been removed from the game. Past the 9th and onto the 10th this game proceeded. Neither Atlanta or Washington gaining an advantage. At least until Our Washington Nationals loaded up the bases with one out in the bottom of the 10th. An edge gained, when The Braves Manny Acosta lost control. A walk to Willie Harris, followed by a seeing eye ground ball single through the hole at shortstop by The Man Continuing His Career Week--Wil Nieves--putting runners on 1st and 2nd. Then, another walk to Pinch Hitter Aaron Boone to load the bases. Our Washington Nationals NOW Sensed The Victory. Our Fans were on their feet in anticipated celebration. Even Our General Manager Jim Bowden was twirling in delight--in his private box. The Game Winning Moment was at hand with FLop at the plate. Not one single person rooting for Our Team--believed this ballgame was not already over. At least until Our Number Two chopped a Manny Acosta pitch right back to the box. Acosta immediately throwing home, whereupon The Braves Catcher Brian McCann tossed to first base to retire Felipe Lopez. Just like that--an inning ending Rally Killing, Double Play. A Collective Sigh of Disbelief not yet heard throughout The New Ballpark was experienced. JimBo dejectedly sitting down in his seat. With the winning run just 90 feet away--Our Washington Nationals had failed. Flop had not delivered. This long affair would continue on. Past Sunset, into Dusk--onto the 11th and then the decisive 12th. A final frame that brought the full gamut of emotions to each and every person closely watching this game. What a rollercoaster ride this became. I am sorry--if you left early--you made a big mistake. Anything can happen in extra innings. Did that ever prove correct this evening. Everyday Saul Rivera was still on the mound--working his second inning of relief. And Our Number 52 was tiring. Who could blame him. 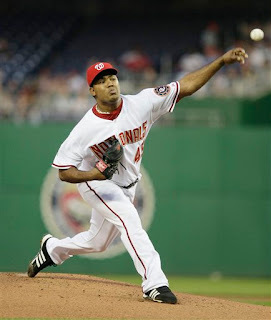 Saul has pitched in 16 of Our Washington Nationals first 28 Games--over 19 innings total. Atlanta saw and took their advantage. The Braves' Mark Teixeira led off the 12th and ripped a liner down the rightfield line. A clean double that eventually found his pinch runner--Martin Prado--advancing to third on a ground out by Brian McCann to Nick Johnson at first base. And becoming the eventual go ahead run--scored by Prado on a clean--first pitch--single to right with two outs by Mark Kotsay. A now 2-1 Atlanta Lead that found many more patrons heading for the exits. Giving up on Our Washington Nationals--those leaving fans made an error in judgement. As the bottom of the 12th turned into one barnburner of a frame. If baseball is entertainment--why would you miss out on The Finale? The Atlanta Braves Manager Bobby Cox sent Acosta back out to the mound for his third inning of work. A decision that looked wise early on. Austin Kearns led off and immediately got in trouble. Two straight strikes put him in a HUGE HOLE. Earlier this April--Our Number 25 would have become an easy out. Not Today--for Austin Kearns became a patient man--and got this decisive inning rolling in the 12th by taking ball four on a full count--arguably--he FINEST AT-BAT of this young season. Then, Willie Harris stepped to the plate and RIPPED an Acosta Fastball right at Teixiera at first base. A Smash that The Atlanta First Baseman could not handle. Quickly, the speedy Harris ranged to first--everyone safe with no outs. Washington Fans now screaming with delight. The Tomahawk Choppers sitting on their hands. A turnaround was in the works and only got better when Nieves mistook a signal from Third Base Coach Tim Tolman and bunted with two strikes. A risky move that turned profitable when Acosta bent over to field the hard stroked bunt and saw the baseball go right under his glove, through his legs and over the mound!! As The Home Faithful Roared Their Approval--Our Washington Nationals were again 90 feet from tying this ballgame--180 feet from winning it--with no outs. Our General Manager again pacing in his Private Box. The Game was again on the line and Our Manager Manny Acta went to the final person on his bench this day--Ronnie Belliard. Having not seen much action since FLop took his starting position--Our Number 10 has remained a content--Team Player. A Professional approach, sitting back and waiting for his opportunity to rise again. Ronnie Belliard's time had now come--and he DELIVERED with a five pitch walk that sent New Nationals Park into an up roar. Not only had Our Washington Nationals fought back gallantly to tie the game--now The Winning Run was just 90 feet away. And guess whose turn it was to bat? Yes--FLop. Having failed with the game on the line in the 10th--Felipe Lopez had his chance at salvation. Everyone left watching Our Washington Nationals was counting on FLop. While The Braves found themselves counting the mistakes of the just relieved Acosta--five walked batters and one crucial error. Lefthanded reliever Buddy Carlyle now standing on the mound in hopes of retiring three consecutive Washington Batters. With the ENTIRE REMAINING CROWD now standing and clapping--FLop settled in--batting Lefthanded. And he didn't wait long. Looking to prove himself--Felipe Lopez swung at Carlyle's very first offering--a fastball in over the plate--that Our Number 2 drove into the gap in left centerfield--over the drawn in Atlanta Outfield--For THE GAME WINNING HIT!! As New Nationals Erupted over this now UNEXPECTED WIN--FLop enjoyed the comfort of being redeemed. Skill, luck and opportunity had all come his way--in one afternoon. How consistently, the Great Game can humble you one minute--then make you estatic the next. Not only were Felipe Lopez's teammates rejoicing in his honor on the field--Our General Manager was celebrating the performance in his Private Box. Curly "W" Number 11 continued Our Washington Nationals recent roll--winners of 6 of their last 8 games--no longer the doormat of Major League Baseball. And The Bang!! Zoom!! of The Fireworks!! signifying that even when you are down--you are still not out. Because--when you least expect it--your Bad Day may well become your Redemption Day. Thank You FLop for hanging in there and stroking the game winner. Thank You Shawn Hill for persisting through constant pain and again showing you belong. And Thank YOU!! Our Washington Nationals for not giving up--when most other teams would have folded. Combined with last night's 6-3 Victory Over The Atlanta Braves--Our Washington Nationals are slowly showing what they can do--when playing good baseball. Redeeming themselves--when some had already given up on them. Shawn Hill is a quality Professional Pitcher. Did he EVER turn some heads today. Going 8 terrific innings--giving up just one run. 94 pitches thrown, allowing just four hits and two walks. The sole run allowed on a two out double by Gregor Blanco in the sixth--then blooped singled home by Yunel Escobar. Other than that damage--nothing--Shawn Hill was OUTSTANDING. Showing signs of a quality Number One Starter, Our Number 41 pitched effectively--and well enough to win. 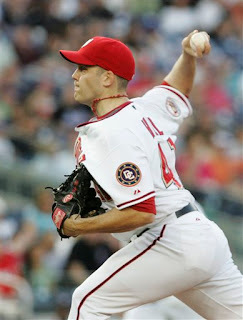 Today--Shawn Hill was the pitcher I have enjoyed seeing since early 2006 at RFK Stadium. Hopefully--he can keep it up. We need him--badly. That Jair Jurrjens--what a talent!! Explosive stuff, good sinker. This man was throwing in the low 90's in the 7th inning. Just two hits allowed all afternoon and ZERO walks. Man--he was impressive. Only Rob Mackowiak got to him for a clean double into the right centerfield gap in the 6th inning. A mistake pitch that proved costly when Mackowiak scored Our Washington Nationals only run--until the decisive 12th--on a groundout by Felipe Lopez. When you throw 84 pitches and 60 of them are strikes--you know what you are doing on the mound. Just 22 years old--this native of The Netherlands has a promising career ahead of him in Major League Baseball. One of these days--Our Washington Nationals are going to have a similar talent on the mound. Additionally--when Mackowiak scored Washington's First Run on that Lopez groundout--Our Number 12 made a beautiful hand slap slide to the outside portion of home plate to avoid the tag by Atlanta's Brian McCann. With one out in the top of the 10th inning--Ruban Gotay was on first base after a single. With the hit and run on--Gotay took off while Atlanta's Pinch Hitter Bryan Pena swung at Luis Ayala's offering in protection. The resultant fly ball to Willie Harris in left field caught Gotay by surprise. Realizing too late that he needed to retreat to first base--Our Number 1 tossed the baseball to Felipe Lopez near second base--who immediately wheeled and ABSOLUTELY FIRED A STRIKE to Nick Johnson at first base for, not only, an inning ending double play--but The Defensive Play of This Game. What a throw from FLop!! TERRIFIC!! One thing Felipe Lopez has always maintained is a dynamite arm. Our Washington Nationals now 5-2 over their current 11 game home stand. Finally--as The African Queen and I were enjoying today's food concession choice at New Nationals Park in the 5th inning--The Club Level "Nacho Grande" (still the best deal in the park) we hear someone laughing and saying to us: "So--How do you like my scoreboard now!!?" Team President Stan Kasten had come visiting. He wanted to know if we were pleased with the changes made to The HDTV Scoreboard. As he stated--just a few short days ago--The Largest Video Screen in the game was revamped. What a difference. The New Set Up far more informative. Lineups for both teams, statistics for each individual batter at the plate or pitcher on the mound. Previous At-Bat Detail. A nice effect of highlighting the current hitter in blue. Even a real time clock located on the bottom portion of the scoreboard--in the center. "When Gregor Blanco stepped to the plate in the very first inning," I said to Mr Kasten, "You put a HUGE SMILE on my face when I saw that scoreboard." Our Team President adding: "We also want to highlight in blue--the pitcher currently in the game--but the technicians need to add that code into the program." That code will be added over the next week. Also, Sohna asked Mr. Kasten if something could be done to the hands of The Curly "W" Clock located just to the right of the HDTV Scoreboard. The Baseball Bat Hands are hard to see. "Most likely not a 2008 change," he replied. "If at all--that would happen for next season." Patience is a virtue and changes don't usually happen overnight--but as Our Friend Jim H stated to Sohna and I as we chatted after the game this evening: "That Scoreboard looked terrific. Stan listened and you have to give him credit for taking care of something fans felt dearly about. I LOVE THE CHANGES. It's exactly what I wanted to see." Sohna and I couldn't agree more. This Saturday Night--The Washington Nationals Dream Foundation will host their annual Dream Gala at The Gaylord National Resort and Convention Center in Prince Georges County. The Black Tie Event to help raise funds and continue their ongoing programs for Youths in the Greater Washington DC Area. Already--The Dream Foundation is involved with Pediatric Diabetes at The Children's National Medical Center in Northeast Washington, and recently committed to provide assistance to The Hopkins Branch of The Boys & Girls Clubs of Washington--as well as--The Earth Conversation Corp in their efforts to clean up The Anacostia River. Upcoming cornerstone projects include The Washington Nationals Dream Foundation's pledge to build a Youth Baseball Academy in The District. Funds for these projects are raised through Donations, Game Day Auctions, The Dream Foundation Sales site (both online and at New Nationals Park) and through proceeds received from Gifford's Ice Cream and Candy's effort to sell "The Dinger"--their exclusive Ice Cream Sandwich available at all home games of Our Washington Nationals. But this Dream Foundation Gala is The Biggest Fundraiser of The Year. Over $454,000 was raised last year. And The Washington Nationals Dream Foundation is looking to beat that mark this coming Saturday Night--May 3rd. If you are interested in participating by purchasing tickets to the event--more information on the Dream Gala can be seen at this link. The Washington Nationals Dream Foundation, will host the third annual Dream Gala presented by the Gaylord National Resort & Convention Center on Saturday, May 3 at the National Harbor. A cocktail reception and silent auction will begin at 7:00 p.m; with a dinner program, live auction and dancing to follow at 8:00 p.m. The Washington Nationals baseball team members, coaches and manager will all be on hand to meet and greet sponsors, supporters and guests. All of the proceeds from the Gala will benefit the initiatives of the Foundation. The Washington Nationals Dream Foundation’s programs are focused on children’s education, health and recreation. The cornerstone programs of the Dream Foundation are the creation of the Washington Nationals Youth Baseball Academy, in partnership with the District government, that will teach the game of baseball and provide after-school educational programs for children in the District; the creation of the Washington Nationals Pediatric Diabetes Care Complex at Children’s National Medical Center, a world-class facility that will provide a multi-disciplinary approach to supporting families of children with diabetes; and the Neighborhood Initiative, benefiting the Earth Conservation Corps and the Boys and Girls Clubs of Greater Washington – Hopkins Branch, created to support small, non-profit organizations in the area surrounding Nationals Park with grants, in-kind donations and additional resources. Nationals television broadcasters Hall of Fame pitcher Don Sutton and Bob Carpenter will serve as the masters of ceremony. The evening’s festivities will include a performance by the D.C. Boys Choir, as well as after-dinner music and dancing. For more information about the Washington Nationals or the Washington Nationals Dream Foundation, visit nationals.com or washingtonnationalsdreamfoundation.org. Just passing along the information for those that might be interested. Just like that, this game had changed--instantly. Chad Cordero had trotted out to pitch the 9th inning. An opportunity to get some work in, strengthen his arm and protect a four run lead. Just 15 pitches later--Our Number 32 was already in The Clubhouse. His future possibly in jeopardy. And the Game Tying Run was stepping to the plate with Big Jon Rauch now on the mound. This game was suddenly in the balance for Our Washington Nationals. All because--after The Atlanta Braves Kelly Johnson ripped a liner--just foul--down the right field line with runners on first and second bases and one out, "The Chief" started waving his arms up and down, before clutching his right underarm. First thought--torn rotator cuff. How bad could this injury possibly be? I am sure The African Queen and I were not the only folks deeply worried. Yet, before those thoughts could be contemplated--there was a ball game at hand. An advantage to protect. A victory to be gained. A save to be made. And when "The Wookie" couldn't finish off Johnson by allowing a run scoring single--who among the 25,285 didn't believe another Braves Comeback was in the making. Like no other team in baseball--Atlanta has consistently, painfully, beaten Our Washington Nationals. With the score now 6-3, this game was now Jon Rauch's--to save or lose. Our Manager Manny Acta really had no other options. Braves runners now on first and third and the free swinging Yunel Escobar at the plate. Time to go the work--which Our Number 51 thankfully did. Not hesitating, Big Jon fired away with first--a slider away--called strike one, then another slider away--swinging strike two. Down 0-2 in the count and backing out on his heels, the Young Escobar was also out of his element. Rauch knew it. His Catcher Johnny Estrada knew it. Most everyone in the crowd knew it. Even Atlanta's Manager Bobby Cox had to know what was coming next. "The Wookie" simply overpowering The Braves Shortstop with a 92 MPH Heater. A swinging strike three for out number two that found the home crowd--roaring its approval. Big Jon fist pumping in jubilation. Happiness that immediately returned to worry when Chipper Jones stepped to the plate with The Braves down to their final out. Already this evening, this sure fire Hall Of Famer had homered at New Nationals Park for the 3rd time this young season. A launched shot off Tim Redding that landed DEEP into The Red Porch Seats in left center. There are a handful of Major League Baseball Players that have OWNED Our Washington Nationals over the first three plus seasons since the return of baseball to The Nation's Capital. Atlanta's Number 10, certainly in the top five. Along with his former teammate Andruw Jones, Chipper and Andruw have combined to slam nearly 30 Home Runs off Washington Pitchers. That's dominance my friend and Big Jon Rauch certainly understood the problem directly at hand. No doubt--even those still watching and standing knew this precarious position as Chipper Jones took a called ball one. Then, was fooled by a 72 MPH curveball. An off speed pitch that Our Number 51 used to set up his fastball. The third pitch in the crucial at-bat, called ball two. With Their Number 10 now ahead in the count, a hitters count--there was no time better but the present for Rauch to bring his best stuff--if Our Washington Nationals were going to maintain this lead. 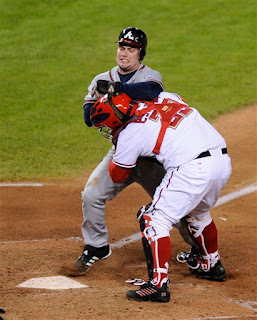 Big Jon Rauch had challenged the inexperienced Yunel Escobar for strike three. Now, he had little choice, but to challenge this Future Hall of Famer. A resultant 93 MPH rocket fired from The Tallest Man To Play The Game. A rising fastball that Chipper Jones swung at, but could not get completely around on. Roars and Cheers from those watching. Big Jon Rauch slapping his right hand into his glove in jubilation. A towering high fly to centerfield that Lastings Milledge caught for the final out of this unexpected cliffhanger of an ending. 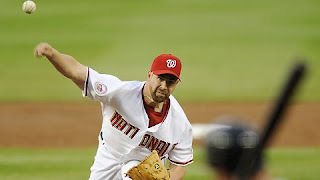 At a time Washington suffered the loss of one of their most prized pitching possessions--Big Jon Rauch had entered this game in an emergency role and became the Final Hero of many tonight. For Our Washington Nationals may well have played their best All-Around Game in April. You see--despite his heroics--"The Wookie" was not the only star. Ryan Zimmerman lead the offensive thrust. A Towering Home Run. The Key Two Run RBI Double--along with one stellar defensive play in the field. Nick Johnson with the second of back to back home runs following "Z" in the third inning. Lastings Milledge with an important two run RBI insurance double in the 7th, and a fine defensive play himself off a Brian McCann drive in the 8th. Saul Rivera working his way out of a 1st & 3rd and no outs situation in the 7th inning--thanks to a heads up defensive play by Felipe Lopez--throwing Matt Diaz out at the plate. Also, a perfect and strong 8th inning set up performance by Luis Ayala. All following an excellent six inning effort by Our Starter this evening--Tim Redding. Curly "W" Number 10 of 2008 was a Team Effort. A Good Ball Game. The Bang!! Zoom!! of The Fireworks signaling that on any given night--there can be more than one Hero--even when Our Washington Nationals lose one. Now--about "The Chief". Diagnosed as a lateral muscle strain--it appears Chad Cordero will be shutdown for some time and go on the Disabled List. Fortunately, Our Number 32 DID NOT tear his rotator cuff. The Medical Staff found his shoulder 100% and solid. But, Chad will undergo an MRI tomorrow to see if he has any tear that was not noticed this evening. Good Luck Chief!! Sohna and I are rooting for you. This injury also changes the bullpen of Our Washington Nationals for the foreseeable future. Chris Shroeder is likely recalled from AAA Columbus. Ayala becomes the FULL TIME Set Up Man. Rauch becomes the Full Time Closer. Saul Rivera will continue to be used EVERY SINGLE DAY. At least until--his arm falls off. Tim Redding pitched quite well tonight. A very high pitch count cost him early--but he settled down to complete 6 fairly strong innings. Outside of Jones' Homer to The Red Porch, only an RBI ground out by Mark Kotsay in the first plated the only other run off Our Number 17 this evening. Tommy Glavine returned from The Disabled List for Atlanta and produced another outstanding outing for this soon to be Hall of Famer. Only Zimmerman's and Johnson's Back to Back Blasts in the 3rd inning beat him. With the bases loaded and no one out in the 1st inning against him--Old Number 47 induced an inning ending double play grounder from Lastings Milledge. Having played most of his entire career with The Atlanta Braves--it's fitting to see Glavine complete his Major League Career with the team he will always be remembered for playing. Greg Maddux (currently playing in San Diego), John Smoltz and Glavine--Three Potential Hall of Famers--all playing the majority of their careers together on one pitching staff. As a fan of baseball--I have to appreciate all three. Great Performers All. Speaking of Glavine--in the top of the 3rd inning--Tommy stroked an opposite field grounder toward Ryan Zimmerman at third base. A short hop ball that Ryan "OLE" grabbed--whipping his fielding glove from down low to up high and firing to first base to retire Glavine. A fine defensive play--but one out done this evening by Lastings Milledge. Our Number 44 has athletic ability--but not the shear instincts of a centerfielder. 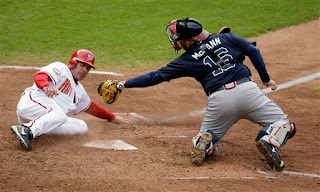 During the 8th inning, Atlanta's Brian McCann laced a deep liner over Milledge's head. Lastings turned twice, corkscrewing himself, while chasing this baseball over his head. A possible lost baseball caught--overtaken by his athletic ability. He has a long way to go before becoming a gifted fielder--even tonight he and Austin Kearns nearly ran into each other on a fly to right center that Kearns had the better angle on. But, Our Number 44's physical talents made up for his short comings tonight--to make The Defensive Play of This Game. Ryan Zimmerman broke out of his April Slump against The Braves this evening. A catalyst all night long at the plate. Ryan with a clean single in the first inning. A Rocket Shot Home Run into The Red Porch Seats in the 3rd. And with the bases loaded in the bottom of the 7th--Our Number 11 delivered The Key Hit of This Game--HAMMERING a Blaine Boyer pitch to the opposite field. A drive over the reach of Atlanta's Jeff Francouer to the right field wall for a game breaking two run double. Zimmerman with three hits, three RBI and two runs scored. His finest game of the young season. Welcome Back Ryan! !--raising his struggling average to .241. Saul Rivera got himself into some serious trouble in the top of the 7th inning. After allowing a leadoff walk to Matt Diaz and a single to Ruban Gotay, The Atlanta Braves were threatening to move ahead in this, then tied game, at two apiece. Yet, Rivera was able to retire Kelly Johnson on a grounder back to the box. Then--in the key moment of this inning--Our Number 52 forced Escobar to slap a routine ground ball to FLop at second base. Playing slightly in--Felipe Lopez scooped up the baseball and fired to Johnny Estrada at the plate to retire the hard charging Diaz. Out Number Two changed the dynamic of this inning and eventually found Saul Rivera getting out of his self imposed jam by retiring Chipper Jones on a ground ball--also to FLop. A turning point inning that could have been disasterous for Washington. Instead--a frame that found Washington rallying in the bottom of the 7th with Zimmerman and Milledge providing the go-ahead blows. Milledge's two run RBI Double a second pitch liner down the left field line off Jorge Campillo. A slammed hit that Our Good Friend Tom--visiting us at the time in Section 218--told Sohna was laid in so sweet by The Atlanta Reliever--even SBF could have gotten around on that pitch. We all laughed, but Campillo did just serve up one juicy pitch to hit. And it cost him--badly. Tom also with the line of the night. While all three of us were chatting about Johnny Estrada and his unusual body type--Tom says: "He looks like Babe Ruth at the age of 36. He also looks like he comes to play in his own Home Made Uniform. The only uniform that fits him." Sohna and I just busted out laughing. Finally--although we did not notice complete Lineups for both teams at the same time on the HDTV Scoreboard throughout this game--after each player batted for the first time--each subsequent at-bat included information about what the hitter had done previously. Something not seen consistently throughout the first 12 Games played at New Nationals Park. Also--can we please leave up the pitch speed a little bit longer on the board. You really have to be looking at it immediately after any pitch to catch the recorded speed. And--can we please quit putting up the speed of Warm Up Tosses--especially for pitchers for Our Washington Nationals. It just seems silly to give your opposition any additional advantage--knowing in advance how hard your pitcher is throwing. If you have attended any home game so far at New Nationals Park, it has not been hard to see the mass of humanity hanging out at The Red Loft. The Open Air Bar that seems have quickly found a following. No matter where your seat may be located on South Capitol Street, The Red Loft and adjoining Red Porch Restaurant are open to you for every game. Now, due to the early success of The Red Loft, an expansion is in the works. According to Team President Stan Kasten, once The Miller Lite Beer Pen is fully completed (The Beer Pen is located between The Red Porch and Section 243--near the HDTV Scoreboard. You can see the Beer Pen situated on the right in the first photo. ), Our Washington Nationals are looking to expand the Red Loft out. Many fans have found hanging out with friends or meeting new friends while watching a baseball game there--very worthwhile. No timetable on when this expansion may take place--but it's clear Our Washington Nationals have realized The Red Loft has quickly become a hot commodity. The consistent crowd at that spot is quite impressive. Coming soon--even more of a opportunity to watch Our Washington Nationals--while hanging out at The Red Loft Bar. When John Lannan started the game this afternoon for Our Washington Nationals--he was not sharp-allowing three walks in the first three innings. Everyone watching must have believed--trouble was brewing. When both Wil Nieves and John Lannan made MENTAL MISTAKES on fielding plays in the 5th inning--trouble again was brewing. And when Wily Mo Pena badly misplayed a liner directly over his head in the sixth--who on hand DID NOT believe Our Washington Nationals were finally going to fall behind. Worry, Concern, maybe even Torment formed the nature of the game this afternoon at New Nationals Park. But, somehow, someway--Our Washington Nationals prevailed in one of the least likeliest shutouts you may ever witness. A 2-0 whitewash of The Chicago Cubs. A Ballgame that included some timely hitting, some clutch fielding, some precise pitching and a strong finish by Big Jon Rauch. Yes, 33,795 were on hand to see Our Washington Nationals overcome their very own issues to complete their second series victory of 2008--and first since the initial week of April. Thanks to Nick Johnson, one of the most patient hitters in the game, who got the ball rolling. I swear--if you needed 10 balls to draw a walk--that man would still lead the league in free bases. His batting eye is remarkable sometimes. But in the bottom of the second inning, NJ connected for a first pitch dunker of a hit in front of The Cubs Fosuke Fukudome. 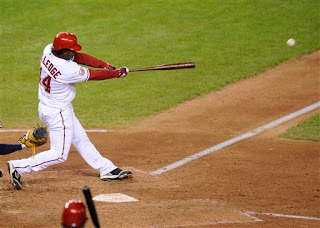 A single that set up the first run of this game after Lastings Milledge advanced him to second on a base hit attempted bunt, that failed, and Wily Mo Pena sent Our Number 24 home for that first run with a grounder into the hole to left field. Another base hit that found the chugging Johnson rounding third--heading toward home--looking to beat the throw from Chicago's Leftfielder Mark DeRosa. A toss that arrived just late--but not before Nick Johnson performed his patented--feet first slide to the outside back corner of the plate. Another effort that found him--once again--rolling over onto his side. First his toes crossed home plate, then his knees, eventually his stomach and finally his face. Yes it was VINTAGE Number 24--safe again--but not pretty. You gotta love it!! Nick Johnson is a sight to behold running the bases. And just think--the Free Tee-Shirt being given out this coming Tuesday Night before Our Washington Nationals take on The Atlanta Braves--will have Nick Johnson depicted sliding. Now--who doesn't want to have that fine piece of artwork? Pena's RBI single lead directly to the eventual final run plated in the game, thanks to The Man HAVING THE CAREER WEEK. Wil Nieves followed with a clean single to center scoring Wily Mo to make this affair 2-0. A lead that held up all afternoon long--but not without some scary moments. In the top of the fifth--Our Washington Nationals played some bad baseball, defensively. And it nearly cost them. With Our Number 31 still fighting on the mound--Ronny Cedeno and Henry Blanco lead off with back to back singles. Then, The Cubs Pitcher--Ted Lilly--attempted to sacrifice them up one base. A failure that now found Cedeno hung up between 2nd and 3rd. All Wil Nieves had to do was run directly at Cedeno--allow him to commit and throw the speedy second baseman out. Instead, Our Number 53 threw BEHIND THE RUNNER to second base?! A bad decision that allowed Ronny to easily slide into 3rd and Blanco to second. Without laying down a bunt--Our Washington Nationals had mistakenly let the runners advance. A precarious position that got only worse when, after Lilly struck out--Reed Johnson followed with a blistering groundball just to the left of Nick Johnson--playing in on the dirt. Nick deflected the baseball, and recovered, only to find John Lannan WATCHING THE PLAY--NOT RUNNING TO FIRST BASE to receive a toss from Our Number 24. Everyone safe--bases now loaded. Just like that--trouble was brewing. Two Mental Mistakes had put Our Washington Nationals two run lead in jeopardy. A disadvantage miraculously solved when John Lannan boar down on Chicago's Ryan Theriot and got The Cubs' Shortstop to hit a two hop grounder to "The Guz" at short. An inning ending Double Play Ball--that found Cristian Guzman stepping on second base to retire Reed Johnson and fire on to Nick Johnson at first base for The Rally Killer. A Twin Killing that got The Washington Faithful on their feet in GREAT Cheer. A possible game changing moment. A crisis averted, at least until The Top of The Sixth--when Fukodome stroked a liner directly at Wily Mo Pena in Left Field. Under the very overcast sky--this looping hit was playable. A sure out completely missed by Our Number 16. The Cubs Rightfielder now standing on second with a ruled double. Aramis Ramirez (who had walked) advancing to third with one out. Another precarious situation that now found Lannan AGAIN bearing down. Not only was trouble brewing again--but really--how long could John Lannan hang on? Apparently, a while longer. You have to give John Lannan credit this afternoon. Throughout this entire baseball game--he had his moments of concern. Time when you had to believe he was short for this game. Again under fire in this 6th inning--he retired Mark DeRosa on a measly pop up to Nick Johnson at first and finally, Ronny Cedeno on a grounder to FLop at second. Walking off the field to a THUNDEROUS applause--at that moment in time--you had to believe--Our Washington Nationals were destined to win. And John Lannan was slowly becoming a bonified professional. You don't always need to have your best stuff to win, but you need know how to get outs. Our Number 31 showed a lot of guts this afternoon. A mindset that turmoil does not bother him on the Big Stage. John Lannan was effective and impressive--without being perfect. That's the sign of a Major League Pitcher. He was destined to win today--deservedly so. Curly "W" Number 9 was a strangely beautiful game, filled with worry, concern and torment. And The Final Bang!! Zoom!! of The Fireworks signaling Our Washington Nationals can win--even when they are in trouble. Character Builders are what the good teams call these type of victories. Did Our Washington Nationals learn something, take it home tonight, and improve themselves from this Sunday Afternoon Onward? When he was all finished and done--John Lannan had completed 7 decent innings. While striking out just three hitters he allowed four hits and four walks over 107 pitches. Lowering his ERA to 2.64--Our Number 31 extended his scoreless streak to 19 innings. 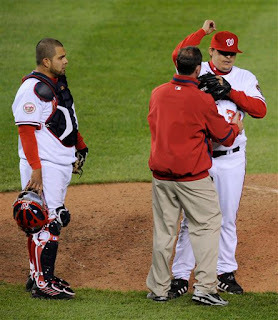 Hector Carrasco of the 2005 Inaugural Nationals holds the Washington Record for Scoreless Innings at 20.2 innings. The Cubs Ted Lilly pitched very well himself. A total junk ball specialist, Lilly had Ryan Zimmerman's number all afternoon long. Our Number 11 looking awful at plate, striking out three times--consecutively. Ted also got Wily Mo Pena twice. Despite "Z's" continued batting woes, he swiftly dove to his left in the top of the 4th inning for an opposite field grounder off the bat of Fukudome. A sharply stroked baseball that found Ryan's glove while sprawling. A reflex catch--vintage Zimmmerman. Whereupon Our Number 11 quickly recovered, got to his feet and easily threw to Nick Johnson at first base for out number two and The Defensive Play of This Game. With Chad Cordero still being held out--Big Jon Rauch was called upon in the 9th to complete the save. A Strong 13 Pitch Effort finding "The Wookie" totally in control. Retiring The Cubs in order--Our Number 51 gave Chicago NO CHANCE for a late comeback. For two games in row--Big John Rauch has looked sharp. What will happen when "The Chief" comes back--Tuesday? Despite his lower velocity--you can't say Chad Cordero has not been effective. In fact, you can say he may be becoming a better pitcher. Please JIMBO--don't give up on him now--when Our Number 32 is becoming a better player. Our Washington Nationals now 2-0, Undefeated, wearing the RED "DC" Jersey and Cap. A Uniform which Sohna and I really like when worn with those white pants. Come on--let's wear them a little more often. By the way--Sohna missed seeing her Former Love--Alfonso Soriano play this weekend. Our Former Number 12 on the Disabled List. Now in his second year away from Washington--that man single handedly made The African Queen a Fan of Our Washington Nationals. No one got her fanny planted in her customary seat more than Alfonso Soriano. I will always appreciate that man for making her a BASEBALL FAN. Finally, in the 8th inning, The African Queen and I were visited by Team President Stan Kasten. He wanted to touch base on a series of fan related questions we had sent him, recently. One issue that he reported for publication is that beginning Tuesday Night--there will be a COMPLETE REVAMP OF THE HDTV SCOREBOARD. "I am not happy with information provided," Mr. Kasten stated. "Around the clock, the technicians are working to reset the board." Mr. Kasten went on to say that FULL LINEUPS will be shown--for both teams starting this week. Also--much of the game related info--including previous plate appearances--that so many have asked for--will be added to the HDTV Scoreboard. "We need to do a better job. I am confident this change will be far better." Mr. Kasten went on to say that the Ribbon Scoreboards down the 1st and 3rd Base lines will remain the same. That is: Player, Position, AVG, HRs, RBI's, OPS. SLG. will continue to be shown. They do look good--already. That provided information by Our Team President has got to make more than a few people happier--including me. You know--Sohna and I will always give him credit--because Mr. Kasten listens to everyone--and responds to the many questions. That's always a good thing. Although Sohna and I never leave ANY GAME early--tonight's was mighty tempting. Just six batters into this game--The Chicago Cubs were leading 3-0. 12 Chicago hitters into the affair--the score was 5-0. Our Starter--Matt Chico more resembled last year's "Starter In Training.'' He wasn't fooling anyone. In fact--Our Number 47 looked frustrated, confused and downright agitated at his work on the mound. Did he ever have NOTHING. An effort that put Our Washington Nationals down inside a big sinkhole. An opened crevasse they had little chance to recover from tonight. 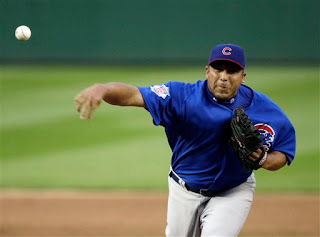 Because as badly as Matt Chico pitched this evening--The Chicago Cubs Starter--Carlos Zambrano--was sharp. Zambrano has terrific stuff--but at times--he can't control where he's throwing the baseball. This evening at New Nationals Park--Their Number 38 was on his game. Seven Shutout innings against a Washington Offense that could muster little firepower against his arsenal. In fact, you got to appreciate a competitor like Carlos Zambrano. Twice tonight--with two outs in an inning--he walked Wily Mo Pena on a full count. Since Wily Mo was batting in the 8th spot--most pitchers would not fret about it-as Our Washington Nationals pitcher was the next scheduled batter. Yet, Zambrano--pissed at himself for walking Pena--each time--frustratingly taunted himself by retrieving the baseball from his catcher--Geovany Soto. The man was pitching a shutout, was going to to get a win--most likely guaranteed--but he still cared about his performance. I LOVE THAT!! I really do. This ball game was out of hand early--and when "The Human Rain Delay" entered in the top of the 8th--it was OFFICIALLY OVER. Jesus Colome giving up two additional runs in another poor outing. Sorry--but Our Number 43 continues to provide little help on the mound. Game Number 25 was simply one of those games you lose. Our Washington Nationals had ZERO chance of winning this evening before a rousing Chicago Cubs Faithful Crowd of 35,188. As much as I personally like Matt Chico--how much longer can Our Washington Nationals keep him on the roster? He's is not making consistent strides of improvement. Tonight's effort showed a talented young man--still looking to find his way. 85 tosses in four innings comes from someone that can not command his pitches. Will Our Number 47 be sent down? Sent to The Bullpen? Will Collin Balester get his opportunity--or Garrett Mock? How about Mike O'Connor? Changes are coming on the mound. Our Washington Nationals have little choice. Have you noticed the quirky play of any base hit down the leftfield line. Not one time during the first 11 games ever played at New Nationals Park--has a ripped shot into the leftfield corner not scored ANY runner from 1st base. The baseball seems to rattle around in that corner--not coming to a dead stop. Although the RFK Stadium Fences were officially only one foot closer--The South Capitol Street Ballpark plays a whole lot differently. And--the shortstop MUST run down the line to retrieve any baseball that caroms off the field seats--angled toward the pitchers mound. We were wondering tonight whether Johnny Estrada could make that run from 1st to Home on a double down the left field line. The Verdict: It would be close--but Our Number 23 would probably lose. There was one remarkable inning pitched tonight by a member of Our Washington Nationals. "The Most Thrilling Closer In The Game" was sent out--in a mop up role--for the top of the 7th inning. Over the course of his 17 pitch inning--Chad Cordero allowed a ground ball single to Mark DeRosa--but struck out both Geovany Soto and Ronny Cedeno--LOOKING--to end the inning. No runs scored. Yet, not one time did the radar gun on the HDTV Scoreboard register a pitch above 81 MPH. That's Incredible?! As we were discussing among our friends in Section 218--What in the world was he throwing? If Our Number 32 is barely reaching 80 on the gun--he must be throwing some wicked stuff. Either Chad Cordero was PITCHING A GREAT INNING--and had GREAT STUFF. Or--The Chicago Cubs Batters didn't believe what The RADAR GUN was saying. Watching Cordero pitch in that inning was fascinating. Then, when The African Queen and I got home from New Nationals Park--I turned on the DVR's. We had recorded both The MASN BROADCAST and The Chicago Broadcast. On the Chicago Broadcast--their RADAR GUN had 'The Chief' consistently at 88 MPH on his fastball--just short of his efforts over the past three years. Additionally--the Chicago Broadcast had Carlos Zambrano hitting 95 MPH on his fastball. The New Nationals Park Radar Gun rarely had Zambrano above 90. So--who is right? The Cub Broadcasters said Chad Cordero looked pretty good. Ray Knight on MASN stated--Chad should be sent to the minors. What a contrast. This is one of those times--I would LOVE to ask Our General Manager Jim Bowden, Our Manager Manny Acta and Our Pitching Coach Randy St.Claire--what their opinions are. Two different broadcasts and Stadium Scoreboard--all with different results. And you know--each team has their own RADAR GUN Guy working the game--separate from the scoreboard. This is a good story--any way you look at it. Man--I would LOVE TO KNOW THE TRUTH. This outcome--the most important to take from this bad baseball game. Lastings Milledge continues to confuse me. The man can get on base. Once he gets there--he has little idea how to run the bases--on his own. This evening--another prime example of his youth and inexperience. After knocking a single--Johnny Estrada stepped to the plate. A wild pitch by Carlos Zambrano allowed Our Number 44 to run to second base. The subsequent throw by The Cubs Catcher--Soto--skipped through to centerfield. Quickly--Chicago's Feliz Pie was on the ball. Everyone in the ballpark--except Milledge--realized Lastings had no chance to advance to third on the bad throw. Milledge got up from his slide at second and ran to third--whereupon Pie easily tossed out Our Number 44 at third base. Aramis Ramirez completing the easy out. No--this mistake made no difference in the game's outcome. But does show--the advances Lastings Milledge must continue to improve on--to become a much better Major League Baseball Player. There was a WILD MOMENT in the President's Race. Like last night--Teddy was leading all the way. As he approached the Finish Line--destined to win--OFFICIALLY--for the very first time--Out jumped a PANTHER. Yes, it was a PANTHER--not a Cub--to tackle Teddy short of the checkered flag. After knocking The 26th President out of the race--the Panther just as quickly--jumped back into the stands. FANS ACTUALLY BOOED. VERY, VERY ODD. As for the concessions tonight--Sohna and I enjoyed the "NACHO GRANDE" offered from one of the Portable Set Ups in The Stars & Stripes Club. For $12.50--your choice of Cubed Grilled Flank Steak, Grilled Chicken or Grilled Pork--served over Fresh Black Seeded Corn Chips, with melted cheese and YOUR CHOICE any of one to 12 toppings. If you wanted all 12--so be it. Those toppings included Jalapeno Peppers, Olives, Grated Cheddar, Guacamole, Sour Cream, Mango Salsa, Refried Beans and Sweet Corn--among others. A good size serving FOR TWO--including Curly "W" Cookies for dessert. For the price--The BEST DEAL IN THE BALLPARK--so far--if you like this sort of stuff. We liked it so much--when Michael Snead--The Executive Chef for New Nationals Park came by us--working another issue--we stopped him and personally mentioned how much we enjoyed this serving. Knowing how many hours this man has worked since early March--getting the food services up and running on South Capitol Street-Sohna and I were very pleased to bring a smile to his face. A grin that one of our Section 218 Seatmates DID NOT receive at The Ben's Chili Bowl Portable Set Up in The Stars & Stripes Club Tonight. We now know so many Jim's in Club Level--we are going to have to find different user names for all of them. In this particular case--Jim (always with his wife Kay) arrived at The Ben's Stand at approximately 6PM--70 Minutes before game time. He wanted to order a Half-Smoke with the fixings. And was rudely told: "WE ARE NOT READY YET--COME BACK LATER." Now the gates have been fully opened for 20 minutes at that point. No food ready. Yet--as Jim told Sohna and I: "Her attitude was--'I don't care if we EVER OPEN UP.' How Nice Is That??" Jim was pissed. Rightfully so. Finally--not two minutes after the conclusion of this terrible baseball game--the skies opened up and IT POURED!! By the time The African Queen and I made the walk down toward the centerfield gate--you would have believed Our Washington Nationals & Chicago Cubs game would have been rained out--if this has began--three hours earlier. I guess even "The Human Rain Delay" couldn't help us out--either--on that level tonight. At least it's baseball-there is a NEW GAME TOMORROW. Our Washington Nationals can still win this series. The Post Game Fireworks had yet to begin. But, the most important Friday Night Pyrotechnics had already concluded. The just finished Bang! Zoom!! of These Fireworks! !--far more invigorating--signaling an improbable win. A WALKOFF two run--bottom of the ninth--HOME RUN to the opposite field. A Game Winner that now found Our Washington Nationals dancing on the field. Our Fans romping in the aisles. And Our Manager hugging tonight's hero. If there was ONE PLAYER on the entire active Roster of Our Washington Nationals--you can bet--virtually NO ONE would have expected Wil Nieves to provide this winning blow. As Charlie Slowes so aptly stated as This Journeyman Catcher crossed home plate to the awaiting arms of his jubilant teammates--"UNBELIEVABLE!!" A Shocker of an ending. 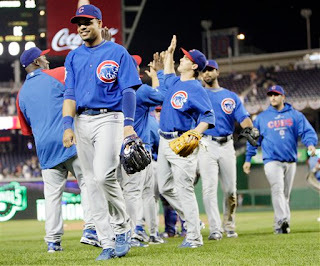 A 5-3 Victory over The Chicago Cubs where 35,154 were treated to a THRILLER on South Capitol Street. The game was tied, 3-3, heading to the bottom of the 9th--thanks to some terrific relief work from both Saul Rivera and Big Jon Rauch (more on them later). Austin Kearns was leading off--and as Our Friend Steve stated--sitting to Sohna's right this evening: "Your Bluegrass is going to score the winning run. I can just feel it." And when Our Number 25 slapped The Chicago Cubs Bobby Howry's very first pitch sharply to centerfield--Steve's premonition began to play out. A dream that slightly faded when Willie Harris followed and--not only did not lay down a bunt--but struck out badly on pitches mostly outside the strike zone. A first out that now found Wil Nieves at the plate. Nieves a mid game substitute for Johnny Estrada. With both Cubbie and Nats Fans alike nervous--Our Number 53 took a called strike one. And after fouling off Howry's second offering for strike two--those Chicago Fans began to relax--sensing a quick ending to a potential rally. An unwinding that led to the final blow of this ball game. Down 0-2 in the count--Bobby Howry looked in to his catcher Geovony Soto and threw a high and outside pitch that Nieves swung at. A connection that drove the baseball to right field--DEEP. A drive that stayed up--until finally finding ground--deposited in Our Washington Nationals Bullpen!! Just like that--This Game WAS OVER!! Curly "W" Number Eight and third win out of their last four games--proving once again--that in baseball--always expect the unexpected--even with Our Washington Nationals. How about those Fireworks! !--courtesy of Wil Nieves very first Major League Home Run. Despite pitching mostly well throughout April--Odalis Perez has ZERO WINS for his efforts. Tonight a six inning stint giving up just two runs while giving up four walks and five hits. The Cubs could not get the big inning going--even though they had some good chances. 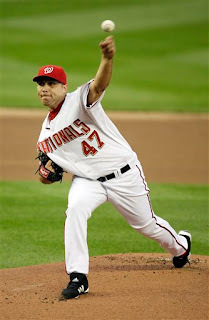 Perez struck out seven Chicago Hitters and left the game with a New Nationals Park ERA of 2.70. Nick Johnson's two run shot off Ryan Dempster in the bottom of the first landed in Section 237--just over Our Washington Nationals Bullpen. 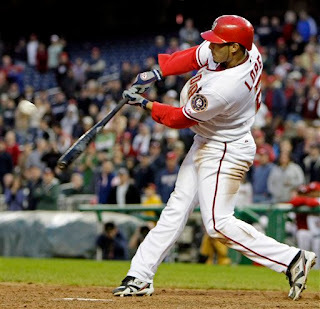 NJ's first home run at New Nationals Park--his third of 2008. In the bottom of the 5th with two outs--Felipe Lopez drove a Ryan Dempster pitch to deep left centerfield. The Cubs Centerfielder Reed Johnson ran hard to his right toward the warning track and the wall. As this launched baseball curved its way toward the ground--Johnson dove--FACE FIRST--into the gravel--extended fully--and backhand caught the ball inches before it hit the ground. A TREMENDOUS EFFORT--A GREAT CATCH--AND FINEST DEFENSIVE PLAY OF ANY GAME SO FAR IN THE EARLY HISTORY OF NEW NATIONALS PARK. What a catch!! Rightfully--even fans of Our Washington Nationals had to stand and applaud that effort. Reed Johnson deserved his due credit. Wow!! Of course tonight's hero--Nieves--also made an excellent defensive play of his own in the top of the 7th. With one out and Ryan Theriot on first base with a single--the explosive Derrick Lee was at the plate against Luis Ayala. Facing a full count in this at-bat, Lee swung at Our Number 56's slider to the outside corner--missing for out number two--while Theriot attempted to steal second base. Wil Nieves--caught strike three--then fired a PERFECT STRIKE to FLop at second base for out number three. A Strike-em Out, Throw-em Out, Double Play that found Our New Number 53 First Pumping In Jubilation, then hand slapping with Ayala. The Crowd roaring its approval. Yes, this evening was Wil Nieves' Night--like FLop enjoyed just 24 hours previously. Saul Rivera saved Our Washington Nationals from a huge Chicago Rally. Our Number 52 shutting down a bases loaded--one out rally--in the top of the 8th. A situation where Luis Ayala started by allowing a leadoff single to Aramis Ramirez followed by another from Kosuke Fukudome and a sacrifice bunt to Mark DeRosa. With runners now on 1st & 2nd with one out and a slim one run lead (3-2)--Why Intentionally Walk The Cubs--Geovany Soto--who had struck out in all three of his previous At-Bats? Are not the odds in Our Favor at this point--with this particular hitter? I did not understand this decision by Our Manager Manny Acta. Even if you load the bases and the next hitter singles--your opponent is still going to score the same amount of runs. Setting up the double play just because it's what managers do by the book--does not always make it right. As this moment played out--Our Number 14 called on last night's hero--Mike O'Connor--who promptly walked in Ramirez with the tying run on just five pitches to pinch hitter--Matt Murton. This situation could have been managed better. Thankfully--Saul Rivera came on to shut Chicago Down. And Big Jon Rauch followed with a solid 1-2-3 top of the ninth. "The Wookie" getting his second win of 2008--thanks to Nieves Heroics in the bottom of the 9th. When both Mike O'Connor and Saul Rivera trotted to the mound to warm up in their respective innings--could someone please explain to me why The MPH Counter on the HDTV Scoreboard was showing the speed of their pitches? They are both warming up--to compete against the competition. Is it really necessary to give The Chicago Cubs a heads up on how fast they are throwing? Speaking of the scoreboard--from the 4th through most of the 5th--the same scoreboard seemingly was on the fritz. Except for batter biography--ZERO other information. Once everything was working again--and wanting to see some statistics of note: Is it possible to see player stats AND what each hitter has done in their previous at-bats, at the same time? In fact--I would love to see WHO IS EXACTLY PLAYING IN THE GAME--both in the field and at the plate--while the game is going on. Stuff like that is helpful. Useful data that allows anyone to follow the game's path--is worth displaying. Finally--The Food Choices Tonight--Pat's Brick Oven Pizza from The Stars & Stripes Club and Sushi--Yes, Sushi!! Although expensive--$6.50 for a slice. The Specialty and Cheese Pizza Slices are of good quality. I enjoyed the "Garlic" spread added on the side--for dipping the pizza dough in. Later--some folks enjoying a Suite invited us inside for a visit. One of their Centerplate Items ordered was Sushi. A selection of various Maki and Shashimi. The African Queen and I loved it. So did our friends--Phil & Robert--visiting us this evening. Those suites are nice--some obviously better than others. But, they are certainly more for entertaining business with baseball as the backdrop--than watching baseball for the sport. Tonight's InGame Photos-(AP) Pablo Martinez Monsivais. As a reminder for all fans of Our Washington Nationals who use the very popular Nats Express--there will be a service change for this Saturday Night--April 26th. In conjunction with DC United playing the second of eight scheduled dates that coincide with Major League Baseball at New Nationals Park--Lot 8 WILL NOT be available to park for free at RFK Stadium. Lot 8 will be a PAID LOT for DC UNITED FANS. Baseball Fans must drive to/park and pickup the Free Nats Express from Lot 7 at RFK Stadium--accessible off Benning Road and Oklahoma Avenue NE or The Whitney Young Bridge (East Capitol Street). Here is the complete Press Release from Our Washington Nationals. WHAT: Washington Nationals fans choosing to park for free at RFK Stadium and take the Nats Express to Nationals Park may park in Lot 7 on all D.C. United home game dates. RFK Stadium Lot 8 will not be available to Nationals fans on Saturday, April 26 or any future date in which the Nationals and D.C. United each play at home. Lot 7 may be accessed off the Whitney Young Bridge (East Capitol Street) or off of Oklahoma Avenue. The Nats Express begins ninety minutes prior to Nationals home games. Just passing along the information--as always. New Nationals Park was jumping--thanks to FLop!!? Felipe Lopez had just let fly the very first Grand Slam in the ballparks history. A Game Changing Four Run Turnaround. A Full Count poke off The New York Mets Aaron Heilman that sent Our Washington Nationals, Our Fans and Our New Ballpark into a tizzy. Even Our General Manager Jim Bowden was seen celebrating in his suite. And unless you were for The New Yorkers, who wouldn't enjoy this moment. The Home Crowd erupting. The African Queen laying one SMACKER of a kiss on my lips in Great JOY!! Believe Me!! The Party was ON! !--at the expense of The New York Mets. Only over Philadelphia would the feeling be more pleasurable. And the forlorn look of My Main Man!! watching this home run ball sail over--not only over his head--but the Right Field Out of Town Scoreboard Wall signifying--that Our Washington Nationals may not be dead after all. Felipe Lopez's Grand Slam really meant so much this evening. More than--the then--7 to 3 tally on the scoreboard. Because after that launched ball--eight rows deep into the seats--No longer did The New York Mets control Our Destiny. No longer did Their Fans take over Our Ballpark. No longer did Our Team succumb to another poor offensive night. No longer did Our Washington Nationals beat themselves. And--at least for this evening--April 24th, 2008--Our Washington Nationals dominated a Major League Baseball Game--Late--when it counted most. No--you are not going to win every game, in some cases not even half--but at least at 9:18PM this evening--a sense of hope was finally realized--that Our Washington Nationals can come from behind--and win--going away. That Moment In Time of Felipe Lopez's Grand Slam--erasing the memories of a one time three run deficit. The possible dread of another frustrating--lifeless--loss. Unexpectedly--Our Team that plays on South Capitol Street was now in control. And Our Fans were losing theirs. 29,750 sitting in on this action. When your team has struggled all season long--there is nothing like a blowout. A come from behind BLOWOUT. For tonight--anyone watching and rooting for Our Washington Nationals could feel the full gamut of emotions--of being a fan. The Highs & Lows that make Baseball So Special. Three consecutive Two Out, Two Strike--Run Scoring Singles given up by Shawn Hill in three consecutive innings put Washington Behind Early--setting the stage for another possible bad loss. But--then--just as quickly-three Washington baserunners reached against The New York Mets Oliver Perez in the bottom of the 5th. Two walks and a single set the table for Our Number Two to begin his Personal Best Night. With Perez struggling and NO ONE warming up in New York's Bullpen--The Mets Manager Willie Randolph rolled the dice--trusting the fact that Our Washington Nationals and FLop--in particular--would not deliver in the clutch--like Our Hitters have mostly done all this young season. Big Mistake Tonight. For when Felipe made Randolph pay with a blistering single up the middle--scoring two and setting up the game tying run--just two hitters later in that 5th frame--The Baseball Gods had finally turned their gaze toward Washington. And FLop in particular. Eventually Six RBI Tonight--matching a career high--while stroking his 4th Career Grand Slam. Who would have imaged--that Our Number Two--just one week ago--on the outside--some would say--no longer in Washington's plans. But tonight, the catalyst. Baseball can be a strange game--and those quirky ways played out in full view at New Nationals Park. The Bang!! Zoom!! of Felipe Lopez's Grand Slam Fireworks signifying that no longer are Our Washington Nationals ready to be buried--at least not yet. And Curly "W" Number Seven of this still young 2008 Season telling Our Fans--that hopefully no longer--will they have to witness that bad baseball of April. Tonight was a fun night. An enjoyable night. For At Least One Game--It was No longer Frustrating to be a Fan of Our Washington Nationals. And how about THAT NOISE WHEN FLop hit his Grand Slam--Just Terrific!! (But "Guz"--Buddy--would you please delay your upcoming at-bat next time--after such a key point in the game. Give The Fans & Felipe Lopez at least 30 seconds to embrace THE MOMENT. You instead went right to the batters box--dug in--and took ball one. We wanted to celebrate more--you took that time away--from all of us). After a 1-2-3 top of the first inning--Shawn Hill struggled with his command and his control. He did not look sharp. And when Our Number 41 gave up three consecutive two out, two strike run scoring singles to Luis Castillo, Oliver Perez and Ryan Church in the 3rd, 4th and 5th innings--the signs of a pitcher in trouble was mounting. His run scoring pitch to The Mets' Pitcher Perez finding Shawn slapping his glove in disgust. A command issue toss signaling Hill was going short in this affair. Fortunately, Felipe Lopez saved his night--later. 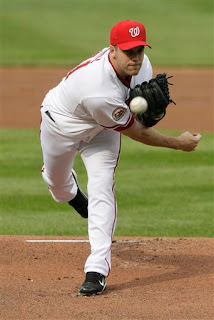 An evening that found--Mike O'Connor--returning to The Major Leagues--pitching in the game and GETTING THE WIN!!. Also--thanks to FLop. Who would have expected this George Washington University Graduate, and Ellicott City Native, to make his triumphant return in such an unexpected way? Fully recovered after two seasons of injures--Our New Number 54 (Formerly Number 48) was recalled in a bullpen shakeup by Jim Bowden. Ray King being sent down to AAA Columbus and giving O'Connor a deserved opportunity. Having fallen by the wayside of prospects as Our Washington Nationals rebuilt their Farm System--Mike was one of Washington's best pitchers this spring--in camp--and unquestionably for The Clippers. Sometimes perseverance is all it takes--because opportunity always develops. Mike O'Connor hung in there--when few believed in him. Now--his time has come--once again. He's a good story. What was Willie Randolph thinking when Oliver Perez was struggling in the 5th--and then--not only sent him back out to the mound for the game changing 6th inning (Yeah that's right--again thanks to FLop)--but allowed his nearly exhausted pitcher to bat for himself--to bunt? At that point in the game--Perez had reached 90 pitches. He was not sharp. Yet, Willie Randolph did not have anyone up in the bullpen. New York's Pitching Coach--Rick Peterson--did not even make an appearance on the mound to speak with Oliver until the 6th--after he walked the first two Washington Hitters. Strange. After FLop had ripped his two run single in the bottom of the 5th--he was standing on second with with two outs and Austin Kearns at the plate. The struggling "Bluegrass" hammered a Perez pitch to the hole between 3rd and short. The Mets David Wright--instinct only--dove to his left--snared the ball in his glove--got up and tossed out the hard charging Kearns at first base to end the rally. A Bang-Bang Play that ended with Our Number 25 stumbling over the bag--making contact with Carlos Delgado and leaving David Wright with--unquestionably--The Defensive Play Of This Game. It was a GREAT PLAY!! Does Carlos Beltran seemingly hit a Home Run against Our Washington Nationals LIKE EVERY GAME? Tonight--on his Birthday no less--he did it again. This time against Saul Rivera--his second of the season. The Mets did rally late--thanks to that Homer and one from Former National Marlon Anderson against Big Jon Rauch. Once again--"The Wookie" not at his best early on. Randy St.Claire having to visit Our Number 51 in the top of the 9th. But Marlon's dinger (and I don't mean The Gifford's Ice Cream Sandwich) made me wonder what he was thinking as he rounded the bases. You may recall--Marlon Anderson and Brian Schneider both participated in The Ground Breaking Ceremonies for New Nationals Park. A Ballpark they may never call their own. My Main Man!! again with two hits, one RBI and one run scored and now the owner of a 10 Game Hitting Streak. Our Former Number 19 having a quality start to the 2008 Campaign. All on a night--Our Manager Manny Acta rested the man traded for him--Lastings Milledge--in favor of the light hitting Willie Harris. Harris did score three runs tonight. 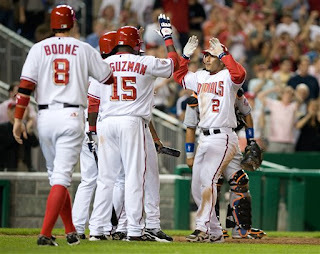 13 Hits total for Our Washington Nationals--two each from FLop, "The Guz", "Z", Wily Mo, Aaron Boone and Wil Nieves. A Season High for the team. Finally--the food choices tonight--Hard Times Cafe Chili Nachos and One Noah's Curly "W" Pretzel. Both good and both enjoyed by The African Queen and I while sitting at a Club Level Dining Table with padded chairs overlooking The Anacostia River and The Douglas Bridge. We enjoyed the private time--before the game began. Fresh off a 9 Day Road Trip--Our Washington Nationals returned home this evening to begin an 11 game homestand. Fresh off a 10 Day Out of Country Experience--I returned home--just in time this evening--to watch them play. 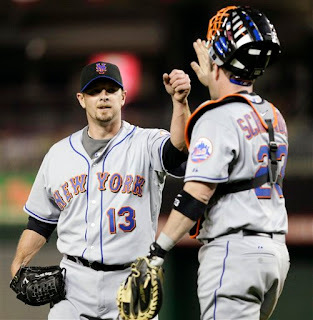 And fresh off about 11 Weeks as New Members of The New York Mets--Brian Schneider and Ryan Church returned to their former home to play their former team in Washington--for the very first time. All three circumstances--Homecomings of sort--usually always fun times. But--Only "The Captain" and "My Main Man!!" went home happy after this one. 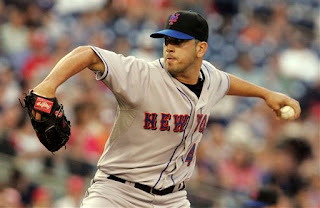 Simply because--Johan Santana plays for The Mets--and Our Washington Nationals continue to beat themselves. Sohna saying during tonight's decisive 6th inning: "The whole time you were away, they would find a way to lose by making simple mistakes." And did Washington ever continue that approach in this affair. With New York's Carlos Beltran on first base with a lead off single. A base hit that knocked Tim Redding from this close 2-2 ball game. All fell apart--again-- with some terrible fielding. None worse than when Ryan Zimmerman charged in on a dribbler hit by Our Former Number 19 off Ray King--a slow hopper that jutted away to "Z's" left at the very last moment. A movement that found Ryan stretching, retrieving and nearly throwing sideways and backwards at the same time. A rushed throw that flew well over Nick Johnson's head at first base and down the right field line. A scored base hit and throwing error--allowing Beltran to run all the way around the bases for the go ahead run. A poor defensive decision--where Ryan should have just ate the ball. Runners on first and second with no outs--far preferable than one run in and another runner standing on third. A mistake that changed the outcome of this game--as just one out later--with Church still on 3rd--New York's Angel Pagan would smack ANOTHER Dribbler, this time down the first base line--a meekly hit ball that Ray King picked up and promptly threw right in the dirt to first base--a baseball that Nick Johnson again had virtually ZERO CHANCE of catching. An almost laughable play--allowing Ryan Church to score The Met's 4th run and even more so--generously scored a BASE HIT by The Official Scorer. An RBI Single for Pagan--who then produced a Homecoming all his own--when he promptly stole 2nd base and 3rd base off King and Wil Nieves--then scored New York's third run of this most important of frames--on a ground out to FLop at second by Brian Schneider. Welcome Home! !--as they say when you enter New Nationals Park. Well--The New York Mets said "Thank You" this evening. What just moments before was shaping up as a good match up between one of the finest pitchers in the game--Santana--against Our Best Starting Pitcher so far in 2008--was quickly over. Not only was Tim Redding out of this game--but eventually saddled with the loss. All on an evening not one single run scored on him--came on a clean base hit out of the infield. A final 7-2 loss. A Homecoming Parade that found New Nationals Park clearly hearing that ugly chant: "Let's Go Mets!! Let's Go Mets!!" Tim Redding did walk three tonight and allowed four hits. One to Johan Santana. A stroked double well over the drawn in outfield to the centerfield wall in the third. A mistake pitch that Johan returned favor in the bottom of the 4th when he allowed Our Number 17 to slam a two out double--also to the centerfield wall. A Two RBI HIT for Redding that briefly gave Washington its only lead tonight. Tim wasn't bad--but he wasn't great. And when your offensive is not helping--he had little chance of winning tonight. Johan Santana is always fun to watch. Consistently in the low 90's with his fastball--he held Zimmerman, Johnson, Austin Kearns and Lastings Milledge--the heart of the order--hitless tonight. Outside of Redding's double--just six singles by Washington--two each from "The Guz", Nieves and Wily Mo Pena. Nothing manufactured tonight on the bases. Santana mostly shutting down the offense--with baserunners forcing him from the stretch. What is world was Jesus Colome doing in the 9th inning? Called up for Mop Up Duty--The "Human Rain Delay" labored through 31 pitches. Does anyone look more uncomfortable out on the mound than Our Number 43? An eight pitch at-bat to David Wright--leading to a leadoff walk. A nine pitch at-bat to Carlos Beltran. Interesting only that Beltran twice walloped two of Jesus' pitches down the right field line--one just foul over the fence. The other--just foul--down the right field line. Strikes that found Colome standing off the mound--hands on hips--showing frustration. Jesus Colome looked baffled all inning long. A poor frame that--not only found Our Pitching Coach Randy St.Claire making a visit to the mound--but Ryan Church taking him to the wall for a two run single. The final two tallies of this game. As clearly of an excellent pitcher that Jesus Colome was before his Disabled List appearance and subsequent surgery for an infection last year-Our Number 43 has never been the same pitcher since. He shows little confidence now--no trusting of his stuff. And since I am on a roll (I am guessing no sleep for 48 hours getting back to DC has me going)--Lastings Milledge continues to play a below average centerfield. Our Number 44 did not make a error tonight--but he badly played a one hopper sharply hit by Schneiderman in the top of the 8th. A no chance catch where he should have let the baseball just fall in front--instead indecisiveness led Milledge to overplay the baseball--deflecting it away to his left. No runs eventually scored--but Lastings needs to improve on his routes to hit baseballs. He is not smooth. Despite the hearing of "Let's Go Mets!!" --a good turnout of 32,780 on a nice evening--weatherwise--at New Nationals Park. Arriving at 4PM Eastern Time--Sohna met me at the airport and we directly drove to the ballpark. And tonight--we tested out Cantina Marina. The Gumbo for $8--Good Serving Portion--Hot, Flavorful and it was good. One of my favorites so far in our slow journey around Food Choices on South Capital Street. Also--we tried their Spicy Cajun Corn Dog. Not something we would normally eat and we were not expecting anything special. But the spices made the item appealing. For $5--a far better deal than your basic hot dog. Even The African Queen agreed--Cantina Marina was a good choice tonight. Sohna again ordered her Five Guys Cheeseburger. Five Guys & Cantina Marina are located right next to each other behind Section 240. The Burger was excellent--as before. But, she was disappointed that in order to speed up the line--Five Guys has decided to cook and bag French Fries and Dispense Drinks well in advance of your order. Subsequently--the fries were cold. We understand its a work in progress. Hopefully--this can be worked out. In The Stars & Stripes Club--Ben's Chili Bowl now has it's very own Portable Stand set up on the third base side--near The Nats Bar. Also line control stanchions are now in place throughout all The Club Level Concessions. At least for tonight--it was far easier to move about The Stars & Stripes Club throughout the game--without being stopped by patrons waiting in a food line. Finally--before tonight's game--Sohna and I were standing down near the field chatting with Richard--one of our favorite ushers. While talking--Brian Schneider happened to come our way. Without hesitation--he walked over and greeted both The African Queen and I. We were very proud he made the effort to reach out--and we asked him how his wife--Jordan and Baby Tatum we doing. Happily he answered--very well. Brian Schneider was pleased to be asked about his family. There is no question that Sohna and I enjoyed his time playing for Our Washington Nationals. And one of his best traits we always enjoyed about Our Number 23--was how well grounded he always appeared. He seemingly cared about Washington and Our Fans--and showed up at virtually every single team event. We will always remember him for that. Honestly--it's very difficult for me to follow Our Washington Nationals from my current location. Too much real business and safety have interceded. Those issues must take precedent from my current location. Although I am aware of the fact that Washington is still not playing well, a 5-14 record--worst in The Major Leagues. A 6-1 loss to The Florida Marlins today adding to the misery. So, commentary will have to wait until our scheduled return this Wednesday. But from afar--its pretty clear--Our Washington Nationals have little Team Chemistry. Maybe more talented than previous squads--but too many individuals--and that needs to change. But it also does not mean there is not something fresh to add to The Nats320 Blog--something fun about baseball in Washington, DC. On April 12th Sohna and I sat down for a very special interview with Mike Shapiro--Senior Vice-President of Business Affair with Our Washington Nationals. Having worked in Legal Affairs with The Atlanta Braves and Business Affairs with The San Francisco Giants--Mr. Shapiro has been brought on board by Team President Stan Kasten to handle the many daily facets of running a Major League Team--off the field. One of Mike's current top priorities is to get The New Ballpark Tours up and running. The $15 inside look at the new South Capitol Street Ballpark began yesterday. A business investment that just scratches the surface of opportunities to come to--not only view New Nationals Park privately--but use the facility for your own personal event--at a cost. The African Queen and I sat down with Mike Shapiro in The Diamond Club last Saturday Afternoon before Our Washington Nationals hosted The Atlanta Braves. With all that now out of the way--here we go. "Well, first we have this wonderful new facility that we want to share with the public. And those of us who work in this business have an obligation to share it--to give baseball back to the people that pay for tickets and love the game as much as we do. And one of those ways to do that is allowing fans to see what this building is like--behind the scenes." "So, in many cases, you have people coming to Washington, DC--from all over the world--who may have the opportunity to buy a ticket and come see a game--but how many of those people actually get to see The Diamond Club and understand all the interesting facts, the artwork here--or in The Presidents Club--go down into The Clubhouse to see what that looks like. Or--go out and sit in The Dugout. We are going to take fans up to the Press Box--to see what that is like." "These are behind the scenes opportunities that most ordinary folks would not have the chance to see--unless we offered it to them." "Yes, that is exactly right." "They are extremely well versed. We have these massive thick books of every section of the ballpark which contains an inventory of all the artwork--whether they be photographs or paintings, or artifacts. And--by the way--that Collection is increasing all the time. Now, part of the Guided Tour they (The Tour Guides) are giving will reflect on this artwork--a great segue into baseball's historical past." "If you come in here (Diamond Club)--you will first see the 1924 World Series Champion Picture (of The Washington Senators). The Final Line Score from that 7th Game--which is a great opportunity for the guide to talk about The 1924 World Series. As you well know--there are some interesting aspects to how this game got into extra innings. The famous pebble. The ball bounces over the 3rd Baseman's head. It's a great story and a part of the tour." "So, the tour integrates the background surrounding all the interesting details about the stadium. How it was built? Why it was built here--all of that--with The History of The Nationals, The History of Baseball in Washington, DC. And, The History of Baseball--generally." "And one of the great things about The Artwork Program--is that everything depicted is not Washington Senators or Homestead Grays. Take a look at those wonderful columns surrounding the main concourse--they are Hall of Famers from all different teams. They are a part of the education process the tour reflects." "Mine too. And you know what? They are not Washington centric because they draw you into the history of the game. Just take a look in here (Diamond Club). These Old Tobacco Cards (T-3 Turkey Reds)--they are not just Washington. They reflect all different teams. So, this ballpark and subsequently--the tour--celebrates The History of The Game." "Yes, there are. In fact, there are a couple of interactive portions. Now again--it's also in process. But, the way the tour is set up right now--we have a couple of fun things that people will have the opportunity to do. One being: When we take the fans down into the batting cages--to see The Nationals Batting Cages--we will have a pitching machine set up. The Tour Guide will have everybody around him involved in a conversation about Walter Johnson. He will then say; 'Would you like to see how fast a Walter Johnson fastball looks?' (everyone chuckling)"
"We have the machine set for 100 MPH--put a ball in there--and let it fly!! They will be able to see how fast 100MPH really looks. So, that is a fun way to teach a little bit about what Walter Johnson was all about." "Then, they will go out into The Nationals Dugout, sit in the dugout--have their picture taken. Then, walk along the warning track and out to The Nationals Bullpen. And while they are in the bullpen--we will have a bag of baseballs. Every single person will have the chance to throw one pitch in the bullpen. It's kind of a fun thing to do." "But, that's not going to be all. Over time--we plan on integrating more interactive things into the tour--but this is what we are starting with." "Which is actually one of the things I have been talking to our folks about doing in The Kids Zone. They currently have video of modern day pitchers throwing to those in the batting cages. Well, I would love to have them produce one with Walter Johnson throwing the baseball." "That is another interactive piece. It's really cool!! (Mike had Sohna and I laughing because his inflection was great). Whenever you look at that HDTV Scoreboard--all 1500 or so square feet High Definition Television--similar in design to what you might have at home. It's all about these pixels--red, green & blue pixels. If one of these modules blanks out--they are interchangeable. On the tour--we allow everyone to touch one and see how this works." "Yes, but our HDTV Screen is not a life and death situation." "Not all of that is in place yet. Like I said, the ballpark is still finding its own level--in terms of artifacts. Mostly, the photographs and alot of the artwork are up. Although, there is still a massive mobile coming, lights on the garages and-of course-the three statues that are going to be in Center Field Plaza. That's all coming. So--much of the artifactual and artistic items are not in place yet. But, over time--over the course of this year and next year--we are going to have a whole lot more." "The visiting clubhouse is currently not on the tour. Only because the best part of the visiting clubhouse are those nice pictures of Washington. But the timing (of the tour) has not worked to allow that visit. Our tour is one hour to one hour and twenty minutes. The design and flow of the tour--the logistics--just don't allow for its inclusion right now." "Only when team is out of town. Because I didn't want to do a cut rate tour. If we did a tour while the team was here--there is no way The Clubhouse or Dugout could be included. Everyone deserves the entire experience. We should not cheapen it. No--I would never do that." "We already have private parties. If you want to rent the Presidents Club--you can. Or, rent The Diamond Club out. We have even had parties where companies have rented the field for batting practice. We do batting practice sessions. We have had party's rent the batting cages downstairs." "Yeah, that's cool. In fact, we have had several of those already. This is all apart of a division called Ballpark Enterprises. Ballpark Enterprises is in charge of generating interest, extending the brand and creating new revenue streams utilizing the ballpark itself. And by extending the brand--ultimately we expect it to be Nationals Enterprises. So, if you are aware of The Fenway Sports Group--they have gone way beyond baseball in marketing their skills and expertise. Well, we intend to do that as well with The Nationals. Eventually--that is going to find its way into fantasy camps. We are talking about a Nationals Cruise--Clinic programs and Summer Camps. A whole number of things. We have a whole group of ideas that we think are going to be revolutionary and fun!! We are going to take The Nationals Brand and expand. But, first we are starting with Ballpark Enterprises--using this facility and tour as the gateway." "it is funny that you mention that. Because when you sit down and write a business plan--you look at what your challenges are. That fact is definitely high on the list of challenges. But, using an old expression--where there are challenges--there are opportunities. What we (The Nationals) have--is an incredible asset--throughout our system of coaches. We have Barry Larkin. We have Jose Rijo and Tim Raines--Darnell Coles--Jon Stearns and Randy Knorr. You go through our list of coaches--and there is an All-Star Group there. Our intent is to use that great resource--and instead of using former players--and this is what will distinguish ourselves from alot of the Fantasy Camps--use our professional coaches as instructors." "If you go to a Yankees Fantasy Camp. You are going to get a bunch of minor league instructors or college instructors. Then, they are going to bring in Whitey Ford, Yogi Berra, Moose Skowron or whomever--to sign some autographs and that's it. Our business plan is bring in our actual instructors themselves--to operate the camp. So, if you go and sign up for Fantasy Camp--for The Nationals--it is our intent that you will really get the experience to be a Rookie, showing up in Florida for your first spring training. And you are going to get hitting instruction from Tim Raines or pitching from Jose Rijo. " "Exactly!! That is precisely the goal. Baseball 101 is the model we are taking and expanding for an entire fantasy camp." "Yes, I agree. I watched it and I thought everything went well. That is something we are now using as the concept to take things to a different level. I am looking into a whole range of opportunities--so we can utilize all these great resources we have." "We actually have quite a few booked for The Kid's Strike Zone. We cater it and everything. The kids get to use the machines, The Sony PlayStations. That part of the ballpark is very, very kid friendly. Also, we have had Bar Mitzvahs booked for The Presidents or Diamond Clubs. We even have a couple of weddings booked. We have not gone out and aggressively marketed the facility yet. We wanted to get the first couple of homestands under our belts and see how the ballpark operated before we went out and marketed the facility. But, even with no marketing--people have been calling up and asking to rent areas out, and we have been doing it." "They are all different, customized based on how much you want to spend of each individual in your party--food, part of the ballpark you wish to use. Do you need a band brought in or a P.A? All of this is customized. So, it's hard to quote a price." "One of the options--and this plays more off your original question--if you are planning an event here is: 'Do you want to have a tour?' There are a menu of options, tours, batting practice, do you want a player as a speaker--any number of different options you can have to throw into your event." "We are trying to make Nationals Park a destination spot and attempt to share the facility to those who love baseball and want the experience of wanting to see it from behind the scenes--or want to have their event be a part of the ballpark." "I will tell you this. We had this corporate event down in The Presidents Club. They all came out on the field and took batting practice afterwards. And a part of the event also was that every participant bought Nationals Jerseys with their names of them. So, they had their ties on--but their jerseys on--and all came up to hit. Their smiles said it all. They were pretty happy. It was quite a great experience for them." (Nodding his head and looking assured) "Weeeee--can work something out!" "But, that is EXACTLY the point of everything we have discussed today. People who love the game--are passionate about the game--this is an incredible opportunity for them to actually take batting practice on the field--which is kind of a cool thing to do. It's also a part of the allure of this building--and it is a fabulous building. It does lend itself very easily to--not only the tours--but for people to come and see it behind the scenes and for planned events as well. What we are finding. The reaction we are getting is that people are generally very happy. Centerplate does a nice job with the catering here. So, the clients have been happy with the food." "Absolutely, the very first event we had here was a kosher event. The Jewish Federation had a kosher event down in Presidents Club. And then they could all go down to the batting cages (if they wished) to take batting practice. It was great. And since you can look down on the batting cages from The Presidents Club--they may have had more people looking down, than actually hitting--cheering them on. (laughing). With that Our Conversation With Mike Shapiro came to an end. During the chat--Sohna suggested the Ballpark Tour should provide a Collector Pin as a keepsake for those who finish. Mike loved the idea and it reminded him of his days with The Giants at Candlestick Park--when for those brave folks that lasted any chilly night game at Candlestick Point--they where given a special "Croix De Candlestick Pin" as a momento. Most baseball fans enjoy pins--we can't imagine a New Nationals Park Ballpark Tour Pin not being wanted. Finally--Mike told Sohna that fans with disbilities will have complete access to The Ballpark Tour--via elevator access and ramps. No one will be turned away--due to a handicap. Also, baby strollers are welcomed on the tour as well.